Welcome to the leading flight attendant employment agency! Take advantage of our 145 contacts in the airline industry! 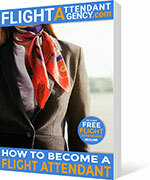 When searching for a cabin crew job the amount of information that gets thrown at you may seem overwhelming, this is why we have collected all the essential information that you need to know in a sleek and easy to read e-book guide. When you sign up to our program you will get an e-mail with the e-book How to become a flight attendant, written with the knowledge of airline industry insiders. Don't waste your time on out of date or misleading information that you might find on the internet, with us you get all the top quality advice in one place. Having a good resume is of paramount importance in getting accepted for a job interview. Our sources say that more than half the candidates get rejected during the resume reviewing stage because their resume lack some essential information that the human resources department of airline companies search for. Don't throw away the chance of working for a good airline company because of some missing information. 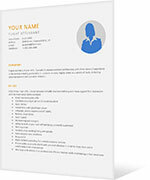 We will provide you with an exhaustive resume template and a complete resume writing guide in our e-book guide. Once you have read our guide and written a good resume we are ready to send your resume to all of our contacts in the airline industry based on your location and the jobs that you are eligible to apply. Currently we have 145 worldwide contacts and the list is growing day by day. We make sure that all of the companies on our list offer a high quality working environment and job security. After we send the resume to our contacts it's time for you to get involved. Make sure to check your e-mail regularly and respond to any inquiry about employment. You will remain a member of our program until you find a job, and we won't rest until that is accomplished. Once you get an offer that you are interested in, get prepared for the interview. Our e-book How to become a flight attendant has an entire chapter dedicated to make sure you are ready for the interview with a lot of advices from professionals which are part of the hiring process and a collection of most likely questions and suggested answers. Hello, I would like to thank you for helping me find a job. Becoming a flight attendant was always a dream of mine, but the choice of airline companies that I applied to was limited to local companies and they seldom hire. Thanks to you I received two interview proposals. Now I'm finally working my dream job, Thanks! Thank you for changing my life! The flight crew lifestyle is exactly the change I needed from my dead end job. I'm writing this to let you know the interviewer called me to let me know I got accepted! Thank you for all your support during this time. I just wanted to say THANKS! Everything helped, from the resume you helped me write to all the tips about passing the interview! THANKS! I have to admit I was sceptical at first but I still tried your service since I was ready to do anything to become a stewardess. I couldn't believe when I got the first call for the interview. Now I'm on my training period and can't wait to start flying! I can't thank you enough! Hello, I would like to tell you I got accepted and I'm waiting for the agent to call me. Thanks for all the help. By signing up to our job finding service you get access to a variety of essential resources that will give you the edge you need to find your dream flight attendant job. Your resume will be sent to all of our contacts in the airline industry. Currently between airline company HR departments and employment agencies we have 145 contacts. Take advantage of our contacts and you will get a job interview in no time. Our e-book How to become a flight attendant contains all the necessary information you need to start your flight attendant career. Among a variety of resources this e-book contains guidelines on how to successfully pass your flight attendant job interview. A sample resume specifically tailored for flight attendants. The guide in the e-book and this sample resume will make sure you write a professional flight attendant resume that will get noticed by airline company recruiters. A resume review from our experts to make sure you have written a high quality resume and provided all the necessary information to get a job interview.